I like a good cocktail. Especially when it’s a pretty one with gin with juniper and sage notes, sweet-tart grapefruit, orange liqueur, bubbles, and a layer of deep red Angostura bitters over the top. It’s a drink I’m calling Dusk on the Prairie. 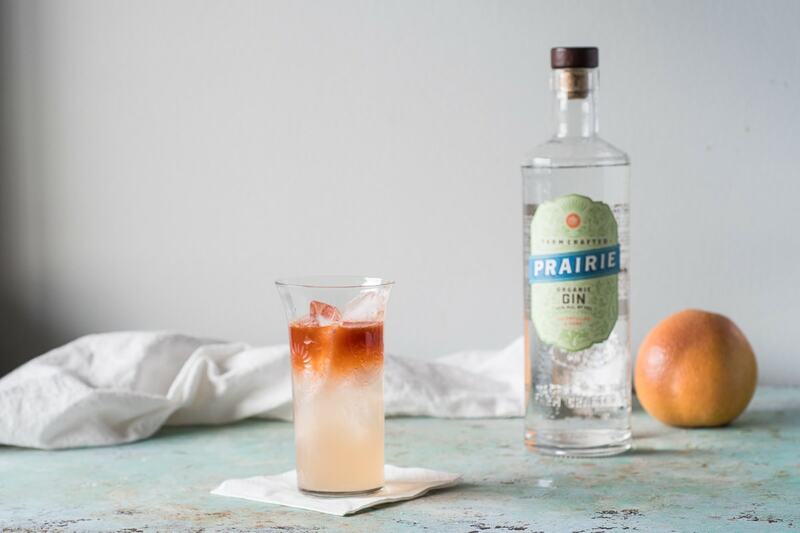 A name that’s inspired by the Prairie Organic Gin that forms the base of the drink and the ways the layers of color evoke an image of sunset in an open sky. This gin is something special. Not just because it’s delicious with the aforementioned herby notes of juniper and sage, but because it’s made with sustainability in mind. 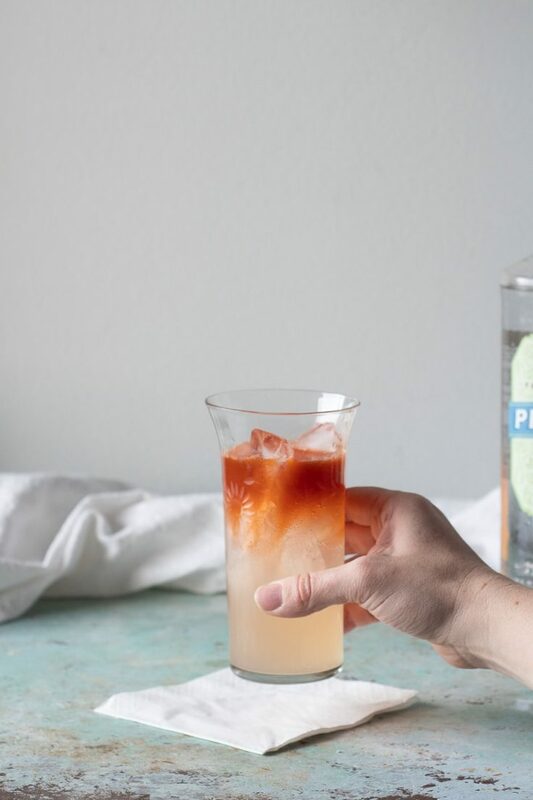 I’m picky about where my food comes from–I look for local organic sources whenever I can–and that extends to the way I think about drinks as well. I’ve always believed we have a responsibility to take care of the land that sustains us, which is why I feel good about choosing spirits made from corn grown on family-owned organic farms in the Midwest. 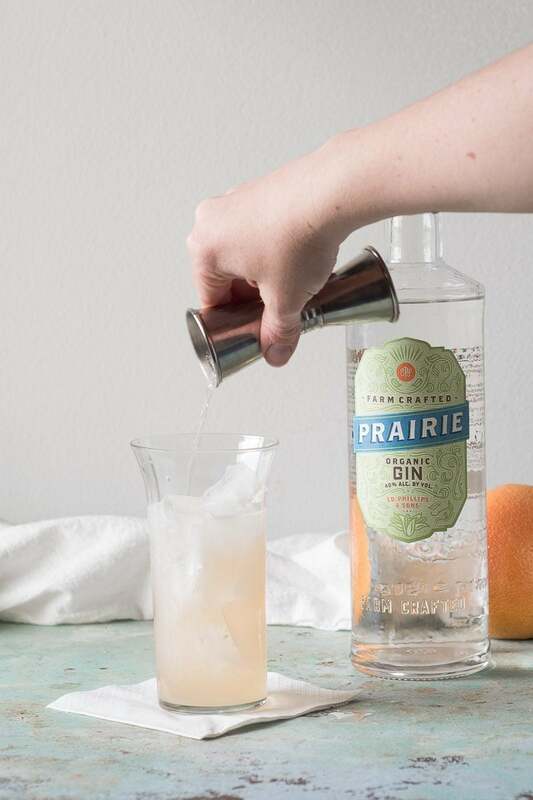 This cocktail takes advantage of the care that goes into Prairie Organic Gin by bringing that farm-crafted, dry, herbaceous goodness to a drink with a Tiki-inspired flavor profile. Dusk on the Prairie combines bright citrusy (preferably organic) grapefruit with the warm baking spices in Angostura bitters. It’s a drink that calls to mind a tropical getaway, a welcome moment of respite here in wintry Chicago. The drink looks fancy, but it’s actually quite easy to make. The cocktail gets built in a shaker, poured into an ice-filled collins glass, topped with soda, and the bitters get floated on top. 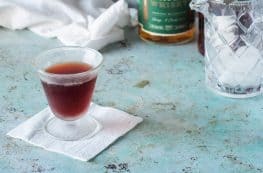 I like to take a sip of the drink with that gorgeous top layer for a hit of the aromatic baking spice notes, then give it a quick stir which transforms the drink into a light, bubbly, citrusy cocktail rounded out with herby, spicy complexity. 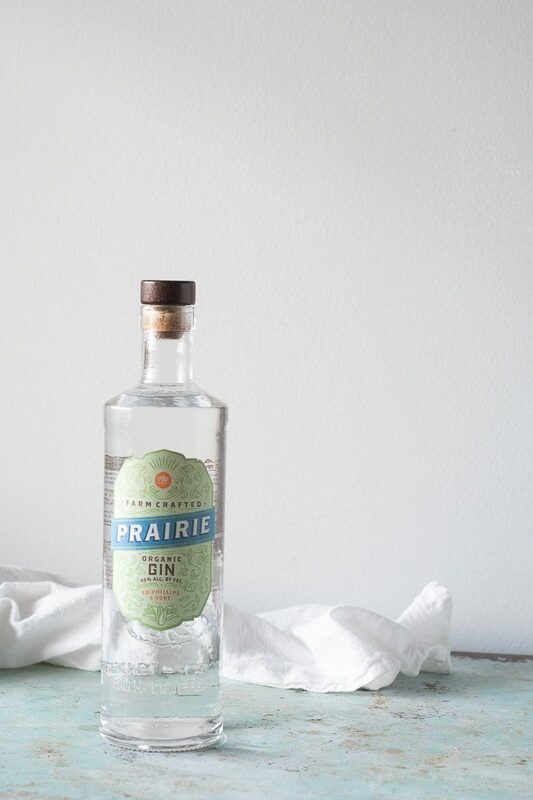 Chicago friends, you can find Prairie Organic Spirits all over the place. Look for it at your neighborhood grocery store or your favorite bar. And enjoy responsibly. This drink is a pretty one featuring Prairie Organic Gin, sweet-tart grapefruit, orange liqueur, bubbles, and a layer of deep red Angostura bitters over the top. A light, bubbly, citrusy drink with some warm baking spice flavor from the bitters. 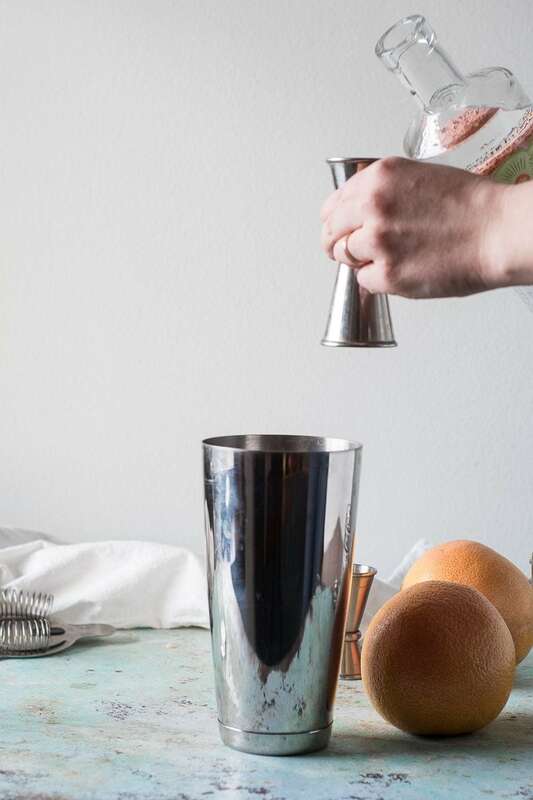 Add the gin, grapefruit juice, simple syrup, and dry Curaçao to an ice-filled cocktail shaker and shake until thoroughly chilled. Strain into an ice-filled collins glass. Add the soda, then invert a bar spoon over the surface of the drink and carefully float the Angostura bitters on top. This makes for a lovely presentation, and I like to take a sip of the drink as presented, then give it a quick stir before drinking the rest. Outstanding cocktail. It’s super refreshing, actually, which I love. Great flavor, perfect for sipping next to the lake. Such a beautiful looking drink and sounds refreshing. Fresh grapefruit juice sounds like it would be perfect in this. So excited to find your recipe! 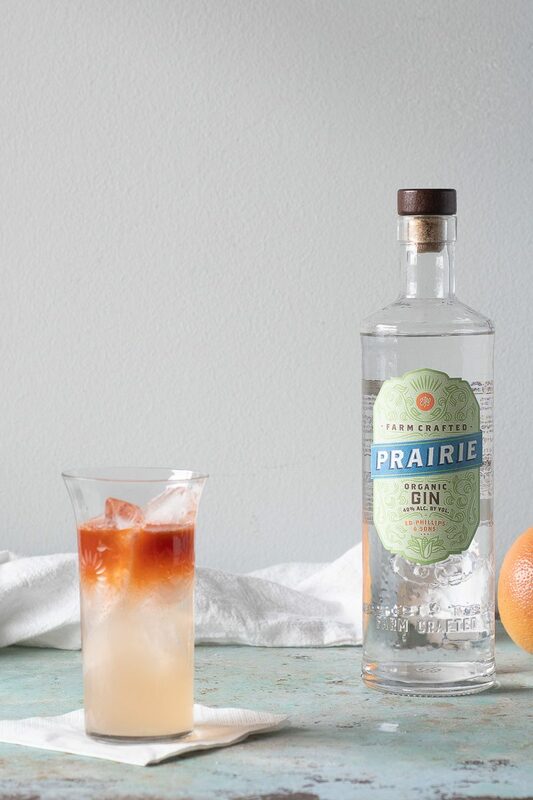 I have some Prarie Organic Gin in my bar right now and I’m always looking for cocktail inspiration. Looks seriously delish! This cocktail is as pretty as it sounds delicious! Wow Those layers! And, I so love the name you chose for it!